My first exposure to college was when I was 9 years old. I went to a UCLA football game with an after school program at my elementary school. I was mesmerized by all the spirit, the 8 clap, the blue and the gold. From that day on, I learned what the heck college was and talked about these plans with everyone. My sixth-grade teacher recommended me for the AVID program and after being accepted into the program I knew college was a part of my future. In middle and high school, I earned good grades, I enrolled in honor and AP courses and I was involved. I did everything I needed to be accepted. I didn’t get into the schools I wanted. I did get into some. I ended up selecting to go to San Francisco State University. Something didn’t feel right about my decision though and I ultimately decided to stay home and go to East Los Angeles College (ELAC). My second semester, something in me changed. I was taking a Friday evening chemistry course (terrible idea by the way), there I began making friends. We would study and study and STUDY. Most of the time in groups and we would have so much fun! Most of us were in that Friday evening class because we worked full time. Learning all my classmates “why”, had me looking at community college very differently. I started to feel more comfortable being there. I saw a flyer for study abroad with ELAC and decided to apply. I spent that summer in Paris, France. I studied French and French Civilization. The program collaborated with different schools, so I had students from San Jose State University and San Diego State University in class with me. It was at that point that I realized, we are all doing the same work. Just because I was at ELAC vs. San Diego State or San Jose State didn’t mean I failed, it meant I took a different route. That fall, I completely changed my perspective. I stopped working and emerged myself completely into my school, East Los Angeles College! I made more new friends, enrolled in honors classes and began to get involved on campus. When I was looking for a space for my passion, Political Science, I couldn’t find one. So, I created one! ELAC Students for Political Awareness (ESPA), which to my surprise continues to be a space for aspiring political scientists and activist. I applied to transfer and got admitted to multiple schools I liked and to the school I originally wanted to go to, Loyola Marymount University. However, I am proud to say that my journey in higher education started at East Los Angeles College, Go Huskies! If you are feeling any of the emotions I felt, I completely empathize. My advice to you is to be present at your new school. Make new friends, get involved! Don’t go to campus just for class. Go to campus and immerse yourself. Have pride in your school! I am so grateful to those Friday evening chemistry friends. We inadvertently created community and that helped me gain confidence and pride. My route to college was not what I had envisioned but I wouldn’t want it to be any other way. Kelly Velasquez is the proud daughter of Salvadoran immigrants. She is a first-generation college student with an A.A. in Social and Behavioral Sciences from East Los Angeles College, a B.A. in Political Science from Loyola Marymount University and an M.P.A. in Urban Affairs from California State University, Long Beach. 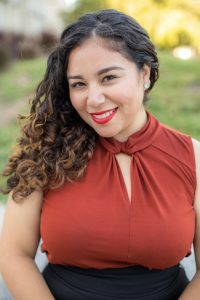 She currently teaches Political Science at East Los Angeles College and Rio Hondo College. A true Angeleno for life, you can find her at the Dodgers stadium rooting for the boys in blue! Kelly is obsessed with her niece and nephews. She also loves to cook, read and travel. Kelly is passionate about equity in higher education and politics.